Grocery Insight digital asset management system with automated data population and customised automatic Powerpoint presentation generation. 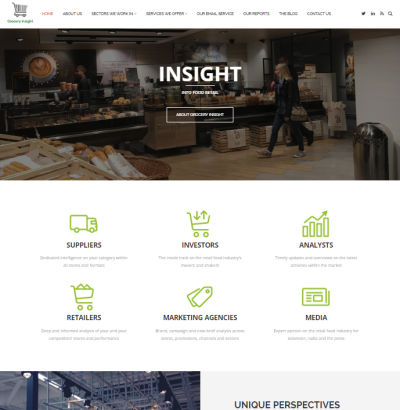 Grocery Insight provides detailed analysis on all aspects of the retail industry, from suppliers and investors through to retailers and marketing agencies. A lot of this analysis is in the form of photographs and they needed a digital asset management system to capture these files and their associated metadata, with the ability to automatically populate certain fields. In addition, a system was required to allow users to select files, then merge them with a selected PPT template to easily generate reports which can be presented to their clients. Logical file structure based on year / month. Automatic data population, with move of file into corresponding folder. Two and three level hierarchies used for populating dropdown fields. Ability to drag files into the correct order for presentations. Upload and management of PPT template files. Automatic merge of images with PPT template and export of final presentation.